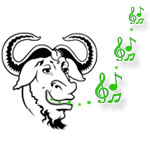 This week on Musical Geek Friday - The Free Software Song! The song is written and performed by the founder of Free Software Foundation and the most active free software advocate Richard Stallman (scroll down for a video of Mr. Stallman performing it himself). Richard wrote this song at a filksinging session at a science fiction convention. He realized he had never written a filksong relating to free software, so he figured it was time he did. He remembered that he had never written a filksong using Bulgarian dance music, so he figured that would be a good thing to do for once. He chose Sadi Moma because it is not too fast or complicated, and is easy to sing. Here it is - The Free Software Song! Join us now and share the software; You'll be free, hackers, you'll be free. Join us now and share the software; You'll be free, hackers, you'll be free. Hoarders may get piles of money, That is true, hackers, that is true. But they cannot help their neighbors; That's not good, hackers, that's not good. When we have enough free software At our call, hackers, at our call, We'll throw out those dirty licenses Ever more, hackers, ever more. Join us now and share the software; You'll be free, hackers, you'll be free. Join us now and share the software; You'll be free, hackers, you'll be free. Here is Richard Stallman himself performing The Free Software Song. The audio quality of this video is poor. Here is a much better version by a band with a hilarious title The GNU/Stallmans. Download "The Free Software Song"